First kit (by a number of weeks) of this vehicle in this scale; amazing amount of detail provided; first rocket launch system kit to provide warhead tips and base elements for the rockets! When the Soviets first sprang the existence of their “Guards Mortar Units” - the first viable modern multiple rocket launchers - on the Germans in 1941 it came as a major shock. For the first time in history an army had rockets which were reasonably accurate, reasonably reliable, and suitably lethal to use on an opponent. While they only came in two sizes – the small 82mm and the larger 132mm versions – the numbers produced were a great asset to the Soviet “Bog Voyny” or God of War - artillery. When the war ended Soviet industry proceeded to improve them as well as add new calibers – 107mm, 140mm, 200mm, and 240mm. Each served a different function at a different echelon. But their technology was old and soon newer, solid-fuel rockets were in development. 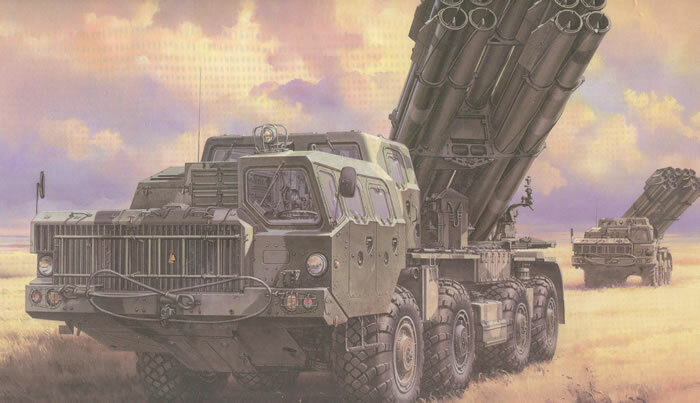 The first one to be fielded in the late 1960s was the BM-21 “Grad”. Firing 9M22 series rockets out to 20 kilometers, a single battalion could fire 720 rockets in the matter of 19 ½ seconds and obliterate a huge area of enemy territory. In 1969 12 Grad launchers inflicted a massive number of casualties, literally in the thousands, to Chinese troops at the battle of Daman Island - and that only took 480 rockets. In the 1970s it was followed by the 9M27 “Uragan” (hurricane) 16-shot multiple rocket launcher system firing a 220mm rocket. These had a range of up to 40 kilometers and six different warhead options from unitary high-explosive to antipersonnel and antitank sub-munitions. Called the “BM-22" and “BM-27" by NATO a brigade of these launchers was part of the 34th Artillery Division in GSFG and more were deployed in combat in Afghanistan. Rumors flew for a long time about a massive 280mm launcher dubbed the “BM-30" which was in development. This materialized in 1983 as the 9K58 “Smerch” (tornado) which initially had 14 tubes, but production versions settled on 12. This system fired a 300mm rocket out to 70 kilometers, and was soon feared by many NATO planners for the flexibility it offered. There are currently more than 350 Smerch systems in service with 12 different countries. Several different variants are noted of which the latest is a lightweight (!) version on a KamAZ chassis with only six rocket tubes as the 9A52-4. They also have a matching vehicle for reloading on the MAZ-7911 chassis called the 9T234. It was a bit of a surprise last year when both Meng and Trumpeter announced kits of the Smerch to be released, but while the latter beat Meng to the street with their SCUD B kit last year, this time Meng is the first one to release their kit. And it is extremely impressive! This year it was noted by Russian author Alexey Kholpotov that Meng is working with at least the UVZ company on models of Russian armor, and from the looks of this kit they also must have had an “in” with Splav. Nearly all of the major components found on the actual vehicle are present and show very close approximation to their originals (unlike the HobbyBoss SS-23 kit where they faked some of the elements), especially in the fire control compartment. It is also the first rocket launcher kit of its type to provide warheads, motor sections and base plates/weather covers for the rocket tubes, major items easily seen on the original but missing on other kits such as the ICM and Trumpeter BM-21 Grad kits. There are 64 steps in the nicely produced direction manual. But of that number most of the first 37 cover the chassis, the engine, and their supporting systems! The chassis backbone assembly takes the first seven all by itself. The downrated V-2 type engine takes 37 parts by itself with the running gear coming from eight separate axle/drive/suspension elements of nine parts to each one. The steering linkage is complete and can be made at least poseable and with work operable. Lights install from the back of the bumper but as it is not a load-bearing item it can be left off until finishing so either the clear lenses may be painted or replacements added. (There is a neatly bent etched brass guard over the front of the openings as well). The jacks do not operate and you have a choice of extended or retracted struts (H43/H52 extended, H44 retracted). The model uses what it claims is styrene-cement-compatible vinyl for flexible hoses and it may be, but some modelers will prefer attaching it with ACC to be certain. Note that the tires are “handed” in regard to tread pattern but the kit does show how to properly install them. The battery compartment is also provided but no cabling for the batteries is included, so detail fans may want to use wire and connect them in series to each other. Cabs are incredibly complete and all doors consist of inner and outer shells, handles, grabs, windows, latches and even kickplates/stowage bins. However, none of them work and they are either open or closed options. A number of items on the decal sheet are for the interior of the two cabins and a key is provided at the appropriate step for their application. Seats are composed of six parts - pans, pads and frames. The fire control cabin comes with at least two radio sets plus the launch controls and automated command and control equipment. Some is mounted on the floor, some on the wall and some hangs from the ceiling so it is a busy area and will need a lot of attention to detail. Even the “readiness to fire” light (J44) is included for the bumper. Detail on this model covers a lot which will probably not ever be seen unless the modeler has the vehicle stripped down; for example, Steps 49 and 50 cover the “multi-cyclone” air cleaner complete with element. Assembly of the rockets and launch tubes begins with Step 56. One of the greatest things about this booklet is that in the manner of the old Revell directions of the 1950s the directions TELL YOU WHAT EACH ASSEMBLY IS!!! Parts Q6/17/19/20, for example, are the fuse setting and correcting rocket guidance input assemblies. The rocket tubes may be assembled with the rocket motor sections, the covered rocket motor sections, or weather covers over the bases at the modeler’s option. Each rocket launch tube consists of four sections, but they are relatively rigid and lock together at the mounting frame joints. Note that while firing control is automatic, the launcher mount still comes with a manual sight and control panel like all other Soviet/Russian rocket launchers, and this is covered in Step 61. Six different finishing options are offered: Victory Day Parade, Moscow 2009 (three color camouflage); Land Forces Exposition, Moscow 2008 (three color camouflage); 336th Rocket Artillery Brigade, Belarussian Army (white over dark green); 79th Guards Rocket Artillery Brigade, Tver’ Oblast, Western Military District, Russia (white 542, red stars, overall dark green); Nth combat unit, North Caucasus Military District, Russia (dark green with white “parade” paint trim); Armed forces of Kuwait (overall sand). A relatively large sheet of decals to include a “number jungle” is included. Paints are all given by color name in multiple languages but are keyed to Vallejo acrylic colors. Overall this is one of the most impressive if daunting kits of recent vintage and can clearly be made into a showpiece if the modeler takes his time and plans out the build.